The only audience member who could have been bored at Parquet Courts’ show in Spirit Hall Sunday night was the baby wearing noise-canceling headphones. Despite one of the band members, singer-guitarist Andrew Savage, suffering from the flu, Parquet Courts inspired mosh pitting and stage diving at its show in Lawrenceville. The New York City-based rock outfit, which formed in 2010, further consists of drummer — and brother to Andrew — Max Savage, bassist Sean Yeaton and vocalist-guitarist Austin Brown. 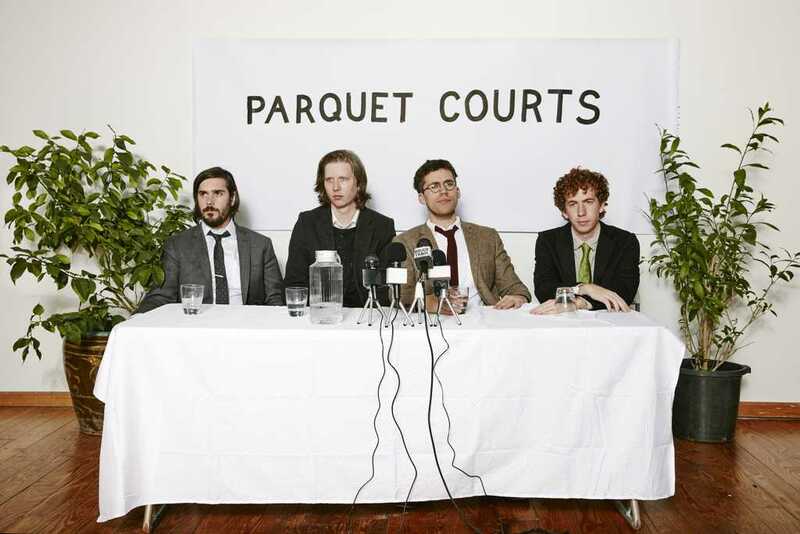 The decor in the 450-person ballroom was minimal, with a simple white banner with the words “Parquet Courts” in black lettering as the only stage decoration, as a part of the band’s well-known no-ads policy. The band members looked as plain as their banner — they could have been mistaken for local baristas out of context. Even their individual voices stayed monotone and dull-sounding, yet demanded the attention of everyone in the room as the harmonziation grew ominous. Their opening song, “Sunbathing Animal,” a repetitive diddy about Andrew Savage’s sunbathing cat, doesn’t seem inherently stimulating. But the way Savage desperately spat out each lengthy lyric against the jarring guitar riffs would have been entertaining regardless of the subject. Despite genre labels, such as art punk, indie-rock or post-punk revival, Parquet Courts doesn’t quite adhere to any category’s rules. The band has released two EPs and five studio albums to critical acclaim — each with its own distinctive sound. Sunday’s show took from the band’s entire catalogue, from its earlier heavy punk influence to its most recent experimental work. The latter has become, in a word, weird. For example, “I Was Just Here,” off its latest album “Human Performance,” uses dissonant chords and polyrhythms to build off their previously more straightforward sound. While on stage, the band members rarely moved and only occasionally interacted with the crowd, saying a few jokes and comments here and there. It was as if their feet were permanently glued to the floor and only had the capacity to bang their heads along to the beat, Yeaton’s sweaty hair flying everywhere. Even if the show wasn’t sold out, it was close to it, and the crowd made up for the band’s stiffness. Fans ranged from baby-carrying couples to old folks in wheelchairs along the walls — not to mention the expected flannel-wearing teens and leathered-out punks. Once the mosh pits started, any hope of cool air quickly disintegrated. But even the heat couldn’t stop the multitude of stage divers and crowd surfers. With each new song came a new wave of people riding a sea of outstretched arms. And when the band played its most popular song, “Stoned and Starving,” there was not a still body in the audience. The song serves as a microcosm of Parquet Courts’ appeal, the basic instrumention giving way to complex tunes and befittingly boisterous lyrics. Parquet Courts lets its music speak for itself — a proven method, considering their last two records both earned Pitchfork’s coveted “Best New Music” award. The band just released its most recent album, “Human Performance,” April 8 — just nine days before the show. And yet, audience members sang along to every one of the songs it performed, new and old — confirmation that Parquet Courts’ bare facade doesn’t translate into its ability to perform.